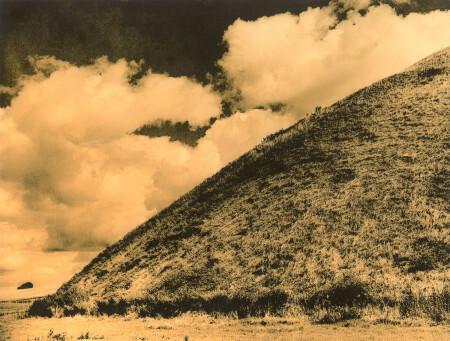 One of the most impressive of our neolithic monuments, the origins and purpose of Silbury Hill are unknown. At nearly 40m high, it is the largest man-made mound in Europe, equal in size to some of the smaller pyramids of Egypt. I made several exposures around the hill, some including almost the entire mound and some sections such as this. Unfortunately one of the entire shots was unfocussed – entirely my fault, a complete oversight! There are still one or two interesting angles to print although I think this is my favourite at the moment. This is a lith print from a 120 film negative made on my Fuji GW690III on Tri-X film processed in PMK. The print was made on FOMA Fomatone MG Classic processed in Moersch EasyLith 1+1+40 @ 28ºC for 12 minutes. The developer was getting exhausted at the time of printing (as was the printer…) hence the higher temperature and longer time. Different colours result under these conditions. The base exposure was 45 sec at f5.6 for a 8½x11¼” print; the base of the hill shaded for last 15 sec; the whole sky area burned for +30 sec, with an additional 20 sec burn on extreme left side clouds. 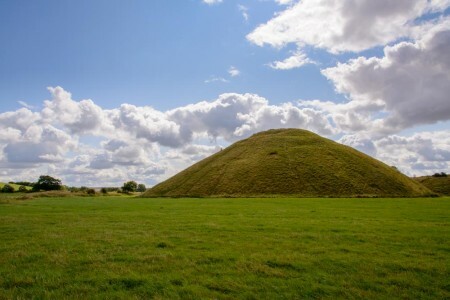 Here is what the whole mound looks like, for anyone unfamiliar with it. This entry was posted in 120, Chemical Lith Process, Film negative, Silver Gelatin. Bookmark the permalink.